Curtis writes "...two lobes which together form an irregular and patchy oval...A vacant lane runs between the lobes...and widens to include the central star." The lobes' prominence make NGC 2371-2 (in northern Gemini between Iota Gem and Castor) unusual in that it is one of four planetary nebulae to carry not one, but two, entries in the New General Catalogue. 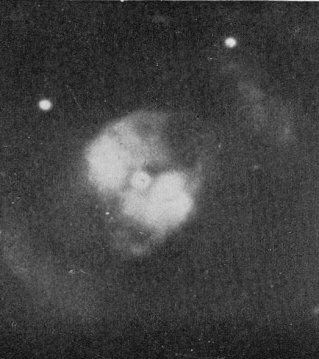 The western, right-hand lobe, down and to the right of the star in Curtis's century-old photograph, is NGC 2371, the other (to the upper left) is NGC 2372, the early explorers not knowing that they were two parts of the same object. The others are NGC 650-1 (Messier 76), NGC 2474-5 (mis-named from another NGC object), and NGC 6164-6, to which we might add IC 5148-50. Surrounding the inner lobes is a huge halo that seems illuminated by the ultraviolet light that sneaks out through the lane. On the right is the highly detailed Hubble view (rotate it about 40 degrees to the right to match Curtis's photo). Here, the upper right part of the halo is faintly visible, Curtis showing it better. The Hubble image, however, reveals opposing jets that are best seen as NGC 7009's ansae and that probably fly along the star's rotation axis. (They are well-seen in NGC 3242 and NGC 6543 as well.) Note their tilt, the upper right one seeming more to come somewhat toward the observer. 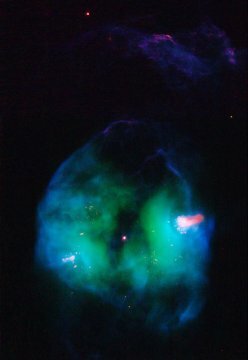 The surrounding nebular gas is disturbed as the jet breaks through. Even at a (highly uncertain) distance of 5000 light years, NGC 2371-2 is angularly one of the larger nebulae, the full extent of the outer halo two minutes of arc wide. The inner lobes stretch out 1.3 light years, the outer halo a full three light years, three-fourths the distance between the Sun and Alpha Centauri. The whole structure is illuminated by a hot 15th magnitude (14.8) central star of 118,000 Kelvin, the star shining with the light of perhaps 700-1400 Suns. The star seems to be near its maximum temperature (though it is hard to tell given the poor distance), and should shortly start to dim toward the realm of the white dwarfs, as the nebula -- expanding at the good clip of 43 kilometers per second -- slowly dissipates into the mists of interstellar space. Left: Image and quote by H. D. Curtis from Publications of the Lick Observatory, Volume 13, Part III, 1918. Right: NASA, ESA, and the Hubble Heritage Team (STScI/AURA).